The 1971 celebration, which heralded a new beginning, also had an historical extension, as the centenary of the beginning of Manitoba College was recognized with returning graduates and a procession north along Main Street to view and inspect Nisbet Hall, built in 1864 and still standing as an empty, wooden structure. The excursion was led by Dr. Duckworth and the first ever female student president, Marilou McPhedran, who was to enter the Faculty of Law in Toronto and proceed to a distinguished career, and to be the recipient of an honorary degree from her alma mater in a special convocation in 1982. The foregoing events were commemorated by the placing of a large stone directly in front of Wesley Hall at the Portage Avenue entrance. The idea originated with Professor David Owens, who suggested a cairn, and was put into effect by Duncan Robertson of Winnipeg Supply and Fuel, and others. John McWilliams, a member of the Board of Regents, supported the idea and took Dr. Duckworth to view two other stone monuments, one at Vimy Park, west along Portage Avenue, set up to honour Canadians lost at “the Ridge” in World War I, and the other at Deer Lodge Place, placed in memory of the painter, Lionel LeMoine Fitzgerald. Following this, Rod Hunter (a long-time member of the board of Regents) arranged with Duncan Robertson for a visit to the company's gravel site at Gull Lake, on the shore of Glacial Lake Agassiz. Frank Pearson, who was in charge of five areas for the company, including gravel, described the scene in an interview with the author, 26 June 2001. Boulders too large for crushing were set aside at the pit, and the largest of these were rolled down into it. 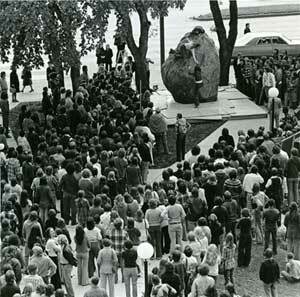 One of the latter, estimated to weigh ten tons, was selected by the university visitors, and an arrangement was made with Sherbrooke Motors to transport the boulder to the city. A trench was dug alongside the boulder to accommodate a flatbed truck, and the boulder pushed onto the truck with a front-end loader. 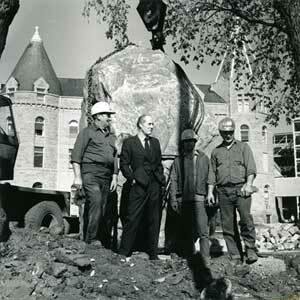 At the university site on Portage Avenue, a foundation was built on the designated place, and the great stone, ten feet high, was pushed into place with the aid of shims. En route, the stone had been weighed at fourteen tons. The new president had always possessed a strong interest in sport and competition, and within a year had organized the Great Rock Climb. The athletic director, David Anderson, had three basketball players demonstrate that it was possible to climb the rock quickly, and in September 1972, the first challenge was staged: at the sound of a starting gun, members of a team of three ran the seventy-five yards from the Wesley Hall front steps to the rock and, one by one, climbed to the top. The record time, 9.4 seconds, was set in 1979 by three students from the collegiate.